Recovering Working Mom: Rain drops always lead to rainbows . . .
. . . but you have to go and find them. 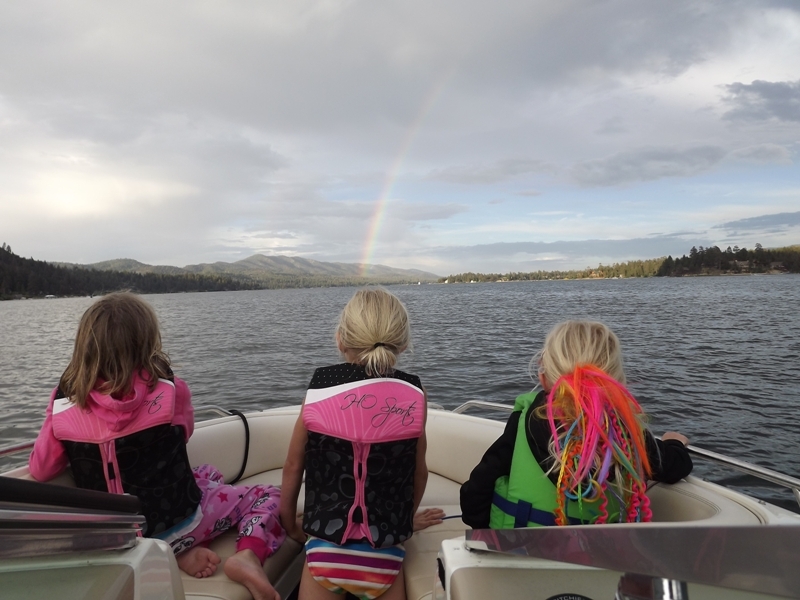 We went up to Big Bear this weekend even though it was right after our last trip that we still haven’t recovered from and even though they predicted thunderstorms all weekend and even though we saw lightning all the way up. We had already paid for the condo and we wanted to get the boat in the water again. 1) If you bother to bring the raincoats because rain has been forcast, put the d@*% things in the boat so that when it begins to pour buckets you are at least prepared. And here’s something I didn’t expect, just because you’re in a boat where you will get soaking wet anyway, you still don’t like to get caught in a downpour. 2) Taking a time-out to go back to the condo, get dried off and play a Game of Life with your kids, can be a lot of fun . . . except when your 4 year-old throws the tantrum of the century and tortures everyone for the next two hours while they’re trying to play. It wasn’t until she found the Monopoly money on the kitchen table that she stopped harassing everyone and entertained herself for a good 45 minutes. 3) When the sun comes out, always put the boat back in the water. We put the boat back in at about 5:30pm and could not have asked for better conditions. It was smooth and warm and after all the rain we’d endured in the morning, the most incredible rainbow greeted us this afternoon. Nature never ceases to amaze. 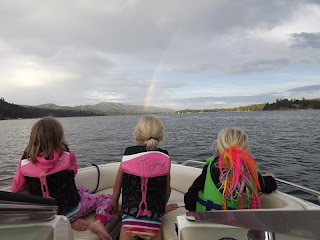 Big Bear Lake – it wasn’t a holiday weekend and there was rain, so it may have been quieter than usual, but there were very few people out on the lake and we just had a ball. Nottingham’s Restaurant in the Robin Hood’s Resort. We had an incredible meal and the ambiance is very nice. The only issue we had was that we ate out on a courtyard that was in the center of the hotel complex and didn’t realize people would be smoking on their balconies.